Categorie archieven: Did you know…? Our fascination with origami started on a rainy day in January in Bouron, France. 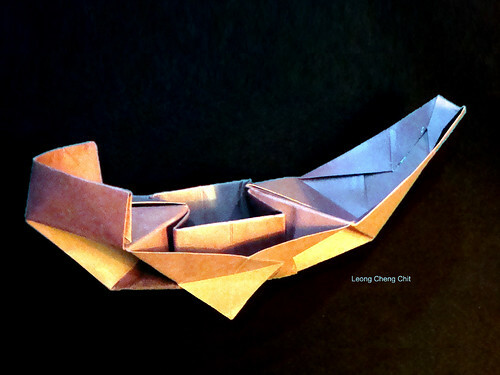 Bored to death, with no other materials than old magazines, and practically flooded due to the rain, folding a paper boat is the first thing that comes to mind. Since we’re curious people, we wanted to know more about the origin of origami. Well, it was easier to fold a paper boat than to find out were it came from. Some say it originated in China, not Japan. The Chinese used to make art-like objects of paper, because paper was very expensive. Later they burned folded paper objects like boats and gold nuggets to please the gods or spirits. According to various sources, Buddhist monks brought the art of paper folding to Japan. The Japanese took it a step further, and added animal figures. This is the form of origami we know today. But what is not so well known is that at the same time, in Europe and the Arabic countries, also similar forms of paper folding emerged. The Arabs folded solely mathematical objects, due to their beliefs. The Moors brought it to Spain where it became known as Papiroflexia and from there it spread throughout Europe and South America. There seems to be a difference in folding between the European/Arabic techniques and those of the Chinese/Japanese. The European objects tend to have so called ‘grid pattern creases’ like squares and diagonals, whereas the Japanese models tend to have ‘judgement creases’: it’s up to the one who folds to decide where he makes the crease. 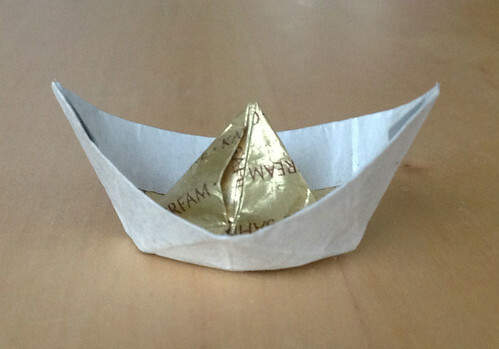 So we think our traditional paper boat probably originated in Europe. And to illustrate that, here’s an early example of a paper boat in an illustration from the 15th century. Chances are that the art of paper folding developed independently in different countries all over the word, originating from pleating fabric, and took off with the invention of paper. Even the name origami is suggested to be a direct translation of the German word ‘Papierfalten’. Because before the 19th century there were different words in use for paper folding in Japan. But in the end it’s all a big guess, since paper is hard to preserve. So this is what we found out, if you think we’re absolutely wrong, or if you have information that we don’t please let us know! On a nice summer day most people like to be out on the water, having fun in a boat. But boats tend to be expensive objects, and not for everyone to enjoy. In the olden days boats were even more expensive. But a barber from Bergum in the Netherlands came up with the luminous idea of building a boat for people who were less fortunate in the financial department. 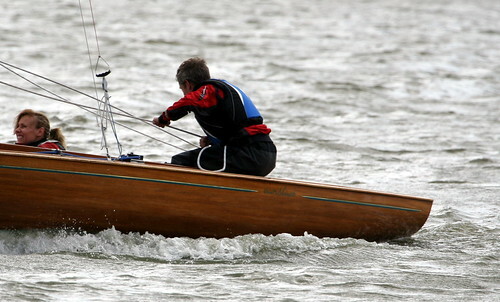 In his spare time, he constructed a boat in a totally unconventional way, with smaller and cheaper pieces of wood. This barber from Bergum inspired us to make a boat with limited means and/or cheap materials. And since paper is sort of the same as wood, and the daily paper ends up in de dustbin every day, there’s a lot of cheap material fur us to upcycle or recycle. Maybe we still sink in half a hour or so, but we are confident that we’re able to conquer the world in a paper ocean-cruiser one day! Where do the Breton stripes find their origin? Well, as the name states, in Breton (formerly known as Brittany) in France. The fishermen in the beginning of the 19th century wore striped woollen shirts called marinière or matelot. These sturdy shirts, knitted by their wives with a special and very secret technique preserved by generations of mothers and daughters, protected them from the elements and were practical in use. The stripes were meant to make unfortunate seamen who had fallen overboard more visible for their potential rescuers. The sweaters soon became the trademark of the garlic merchants, and adopted the nickname of Chandail, a shortened version of marchands d’ail. On March 27th 1858, a law called the Act of France declared the striped shirt a part of the regulatory Navy uniform. This version of the Breton shirt was made of tricot with a boat neck and counted 21 blue stripes, symbolising all Napoleons victories and thus giving the practical stripes a patriotic colour. The garment soon found its way to sailors and fishermen all along the northern French coast. It had probably more to do with its practicality and ease of use than its fashionable looks or patriotic symbolism. But it really made its cross-over to the fashion world when Coco Chanel spotted the shirts during her stay at Deauville. She combined the striped shirt with a pair of high-waisted wide trousers. Not for men mind you, but for women. Nowadays the Breton stripe has become iconic for everything marine-orientated. So whether you’re in or out of the water, wear the Breton stripe, just to be safe. Why wear blue when boating? Wearing blue on a boat isn’t something that has been ‘en vogue’ the last few decades or so. When we tried to trace the origin of nautical clothing, the earliest descriptions we found were about Roman ships. 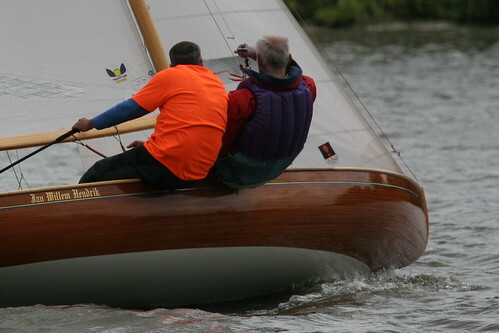 They used light blue sails for their boats and the people aboard wore matching colours. This wasn’t because they’d found a big barrel of blue dye and were at a loss what to do with it. The blue sails and outfits were meant to have the same colour as the sea, so the Romans would blend in with the environment and have the advantage during attacks at sea.